When you have a home of your own, it is important to protect it and watch over it! Well, with a security camera, of course!! But beware - not all home security cameras are the same and it is important to pick one that fits your needs and won't cause more problems and headaches. My husband is big on home security and has tried several different home security cameras out so he has (almost!) become an expert on what to look for! Recently, we received the brand new eufyCam E from the Anker brand - the No.1 Amazon Best Seller of Electronics and he is REALLY happy with it! It checks all the boxes on what he is looking for in a security camera - including a long battery life (nobody likes paying for and changing batteries repeatedly! ), night vision and easy to install! eufyCam is designed from the ground up to offer wireless freedom. They eliminated power cables, wall outlets, and the need to drill holes, giving you freedom to install eufyCam practically anywhere. Stick the mount onto any flat surface and eufyCam’s ready to go—in less than a second; or just stick it directly onto most metallic surfaces. 1) 365-DAY BATTERY LIFE: IP65 weatherproof-rated camera runs for 365 days (or 3 years in Standby Mode) per charge indoors and out. My husband LOVES this fact and switched to this camera especially for this reason! 2) FULL HD SURVEILLANCE: 1080p resolution, combined with our night vision technology, ensures video is recorded with crystal-clear quality both day and night. Night vision is a MUST when looking for a security camera for your home! 3) NO MONTHLY FEE: eufyCam E doesn’t require any monthly fees to use, and comes with a 16GB microSD card that stores up to one-year’s worth of recordings. Cloud storage service optional. 4) EASY INSTALLATION: Just stick the mount onto any flat surface and wireless surveillance with 2-way audio is ready to go. No one wants to mess with a hard to install camera for hours! You don't have to with the eufyCam! PLUS, it has TWO-way audio AND Military Data Security! And in the box is included everything you need to get it installed quickly and easily: eufyCam E, HomeBase Station, Magnetic Indoor Mount, and Secure Outdoor Mount. 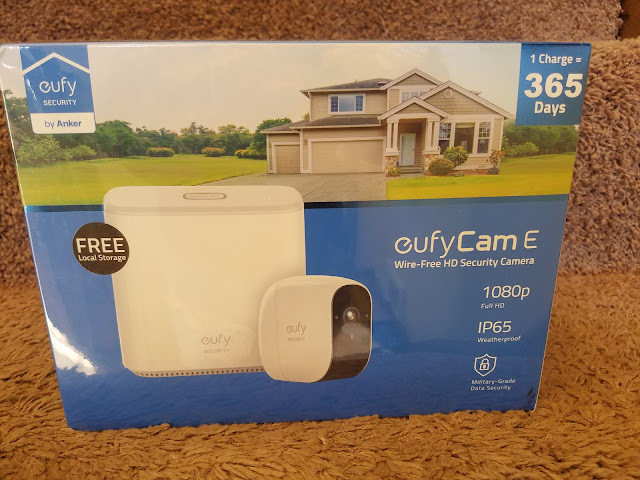 If you are looking to keep an eye on your house and protect it from intruders, whether night or day, eufyCam E is a great way to get started on house surveillance! It passed my husband's picky standards and it is helping us feel more secure and protected, especially when we are gone from our house!